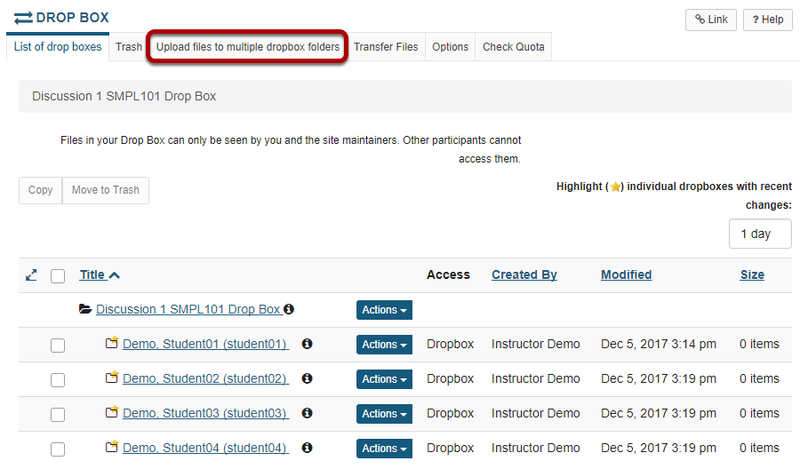 Sakai Guides and DocumentationSakai Complete User Guide Drop BoxHow do I upload files to multiple dropbox folders? Select the Drop Box tool from the Tool Menu in your site. Select "Upload files to multiple dropbox folders". Zoom: Select &quot;Upload files to multiple dropbox folders&quot;. Select the file to be uploaded. Zoom: Select the file to be uploaded. Click the Choose File button to browse for and locate the file on your local computer. Optionally, you may also edit the display name of your file if you would like it to be different than the file name. Select the destination folders for your file. You will see a list of the student folders in your course Drop Box. Select the student name or group from the list of "Available users" on the left and use the arrow buttons to move the name or names over to the "Selected users" on the right. If you want students to be notified about the file upload, select the box next to Send an email notification to the student. Prev: What is the Drop Box tool? Next: How do students add items to the Drop Box?